I'm one of those obnoxious people that has typically finished buying holiday gifts and wrapping them by Thanksgiving. Primarily, my motivation is that I truly hate the holiday crowds. But also, I like being able to sit back and have fun in the days leading to Christmas. Which is why I love doing Shutterfly cards every year. Their site is easy to use and quick (and I don't have to leave the house! ), so I can get my cards ordered efficiently and have them ready to roll in the mail at the end of November. Plus, Shutterfly has very cute designs. There are greeting cards and photo cards and so much more to choose from. I've even done some of their photo gifts before which have been huge hits with family members. I love how personalized you can be. Go check out Shutterfly and simplify your holiday prep! Are you already thinking that far ahead, or do you like to wait until the last minute? Do tell! Disclaimer: I received a promo code for 25 free holiday cards from Shutterfly to write a post, but all of the opinions expressed are my own. If you are a blogger who is interested in participating in this promo with Shutterfly, you can contact them here. Creating a holiday photo card with my kids is always a favorite activity for me. I've actually already received my cards in the mail! I would join the promo, which is a very nice gesture by Shutterfly -but I use Kodak gallery, which has the same services. Both are great companies to use. I'm like you - try to get it all done early because I also hate holiday crowds. I also do as much of my shopping on line as I can, because the stores and malls aren't my favorite way to spend time. We sent picture cards last year, not sure what we are doing this year, but I had better figure it out soon. Can't wait to see what you do. What a great promo..I loved Shutterfly when I ordered from them before. Great service! 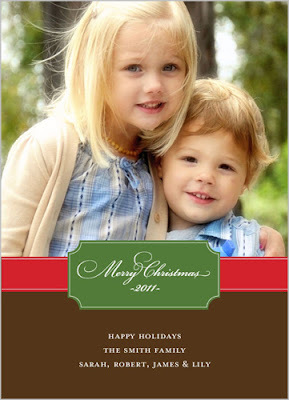 I have used Shutterfly on several occasions and they're great! I'm looking to print a calendar this year for some family Christmas gifts. I hope they'll like it! I feel so behind.I haven't even thought about this yet. Love this idea. I'll have to check them out. Your preparedness is inspirational Lisa. The Mrs. and I were just talking about cards the other day--we need to get an earlier start this year. Great, thanks for the tip, I will check Shutterfly out. With your busy life, it must be nice to be done early with all the holiday shopping. I love Shutterfly!!! In fact, I need to get on the ball and write my post!!! i love receiving photo christmas cards. my boys are too old to sent them anymore but i always did in the past!! Not to brag, but I am slightly famous for my annual Christmas cards--I write letters. Not just any kind of mommy-letters, one year I wrote a 1-act play starring my family, for example. So, yes. Concept has been decided and we're in the early stages of drafting it. I love shutterfly! Use it for all my picture needs. Ya truly speak the truth sweetie, Sutterfly is fabulous and soooo many options! I started using this kind of card last year, and it really saved time! Already signed and no need to print and attach pictures! Definitely 'last minute' Lisa - some people never learn. Nice cards. A very personal touch. Shutterfly does a nice job, Lisa.... Think you are smart to get things done EARLY. I spend hours working on holiday cards, then completely forget to mail them. :) But these sure are cute. I really hate the Christmas shopping crowds too, but I can't say I have it all done. I haven't sent out Christmas cards in ages! De nuevo por tu casa. Siempre un placer volver por aquí. i want to so badly be done with christmas stuff early so i can enjoy too -- this year i don't think it will happen, but i'm going to try! I have done a picture Christmas card since I first had babies. I love receiving them too! 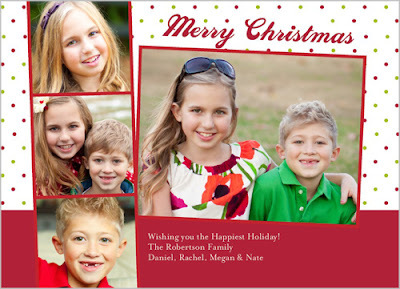 I love the photo christmas cards!